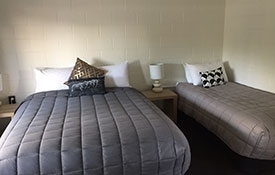 Enjoy our renovated motel units situated in the heart of Fairlie, just 44km from Lake Tekapo. 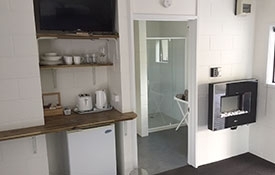 There is the choice of 5 studio units with ensuite, new beds and heaters, heat pumps/air conditioner, mini kitchenette and free WiFi. There are flatscreen TVs with Freeview. A continental breakfast is available on request. All units have a private deck and courtyard plus a covered carpark. Comfortable ensuite studio unit with a king-size bed. This unit has free WiFi and flatscreen TV. 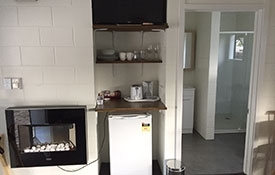 Mini kitchenette with fridge, jug, toaster, tea/coffee and microwave on request. Modern decor/fittings, wall heater and heat pump/air conditioner. Private deck and courtyard. Sleeps 2 people. 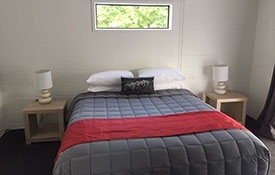 Comfortable ensuite studio unit with a queen-size bed and a single bed. This unit has free WiFi and a flatscreen TV. Mini kitchenette with fridge, jug, toaster, tea/coffee and microwave on request. Modern decor/fittings, wall heater and heat pump/air conditioner. Private deck and courtyard. Sleeps 3 people. 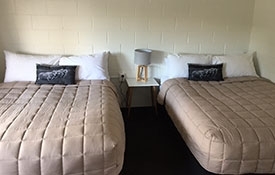 Comfortable ensuite studio unit with 2 double beds. This unit has free WiFi and a flatscreen TV. Mini kitchenette with fridge, jug, toaster, tea/coffee and microwave on request. Modern decor/fittings, wall heater and heat pump/air conditioner. Private deck and courtyard. Sleeps 4 people.